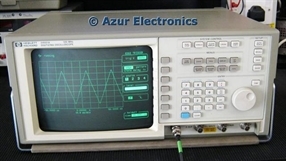 An oscilloscope is an essential item of test equipment. It enables you to look at the waveform of a signal with a display of amplitude vertically against time horizontally. I currently have 3 Oscilloscopes with a bandwidth from 50MHz to 300MHz. Ideally you need an oscilloscope with a bandwidth 5 times higher than the highest frequency you want to measure. Tektronix 468 Digital Storage Oscilloscope . This has a 100MHz non-storage analogue bandwidth and a 10MHz digital storage bandwidth with a 10cm x 8cm screen. With 2 vertical channels of 5mV to 10V per division and 20ns to 5s per division horizontal sweep rate, plus intensified and delayed timebase. Also included is a DMM which is operated with cursors for time and voltage on the waveform displayed. Other features are: X-Y mode, Z axis input, trigger display. This is my main bench Oscilloscope. For details see Tektronix 468 Digital Storage Oscilloscope. 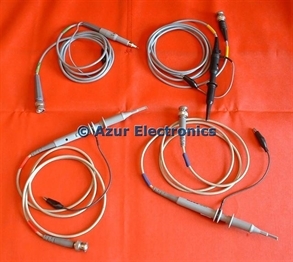 I have 4 oscilloscope probes: 2 are ISO-TECH x1 and x10; 1 is a Greenpar x1 and x10; and 1 is unbranded x1. These are all general purpose 100MHz probes. 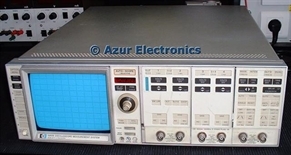 The HP 1980B Oscilloscope has now been SOLD so I am looking out for another Oscilloscope as a backup to the Tektronix 468 and maybe with a higher bandwidth. For details see HP 1980B Oscilloscope. 3 used Oscilloscopes have been acquired as part of a 'Job Lot'. 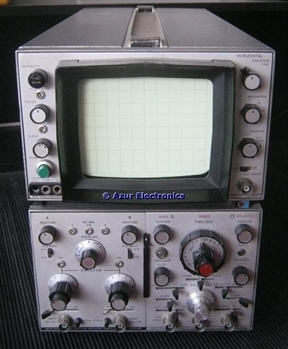 The Oscilloscopes are a LeCroy 9310 300MHz, a HP 54501A 100MHz and a Hitachi V-525 50MHz. All 3 are faulty so will take some time to repair. 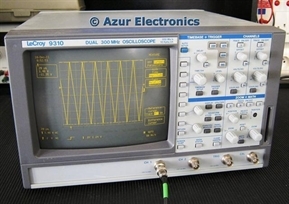 LeCroy 9310 Dual 300MHz Oscilloscope. I use this Oscilloscope on a trolley for any accurate or complicated measurements. The HP 54501A 100MHz Digitizing Oscilloscope intially worked correctly then developed a power supply fault. For details see HP 54501A 100MHz Digitizing Oscilloscope. 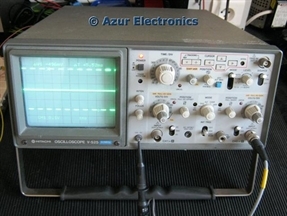 This Oscilloscope has now been SOLD as I do not need 2 DSOs. The Hitachi V-525 Oscilloscope has a 50MHz bandwidth and digital on screen display of amplitude and time using cursors. For details see Hitachi V-525 Oscilloscope. Now repaired, this Oscilloscope has been SOLD. The HP 8922A GSM RF Test Set includes a digital oscilloscope with a frequency range of 2Hz to 50kHz. 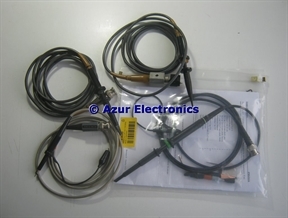 For details see HP 8922A GSM RF Test Set. This Oscilloscope has now been SOLD. The HP 180A Oscilloscope has a 50MHz bandwidth. I will probably keep this for occasional use. 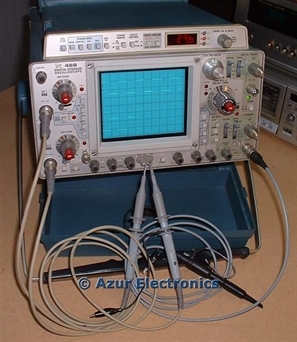 For details see HP 180A Oscilloscope. Some more Oscilloscope Probes acquired. All need testing.